Posted By PA Breast Cancer Coalition on June 16th, 2017 at 10:49 am | 0 comments. When I heard the words “triple negative breast cancer,” I had no idea what they meant. Because of my faith though, I soon decided that for me it means triple positive faith. I felt I was triple positively blessed by the Holy Trinity … Father, Son, and Holy Spirit. I was diagnosed with a routine mammogram in 2010 and then had a lumpectomy, chemo, and radiation. I had the best support team ever with my children, my friends, and family. After about a year, I joined the Cancer Support Community of Philadelphia and met Yvonne McLean Florence and Sarita Joy Jordan there. They both told me about the PBCC, and Yvonne invited me to join her at the PBCC conference in 2015. I enjoyed the conference so much, especially when they announced at the luncheon that 3D mammograms would be covered by insurance. That was a “wow” moment! I was also glad to be able to meet Dr. Edith Mitchell, and to hear about her research on triple negative breast cancer. That is another reason I like the PBCC, because of the research. Going through breast cancer made me a much stronger person. I have always been the quiet, shy one. This seemed to bring me out of my shell because I learned you could be a positive force in someone else’s life. I want other women to know that this is not your battle. You have to trust and believe that cancer is not a death sentence. You can keep going and keep moving. They will continue to find new treatments and it will be OK. 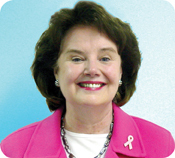 Without the PBCC, there would be so many people struggling to get mammograms now. Also, 3D mammograms still would not be covered by insurance in Pennsylvania. Without the PBCC, we would be back in the stone age. Praise Worthy Creations and Events honored Gloria with the Sarita Joy Strength Award at their annual Pink Tea in April. 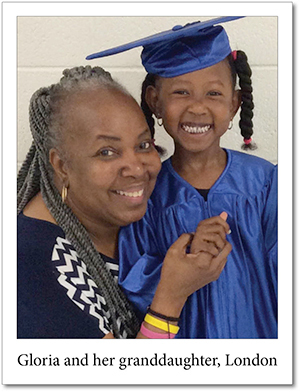 Yvonne was one of the recipients last year and this year the award was renamed to honor the memory of Sarita Joy Jordan, who represented Philadelphia in the PBCC traveling photo exhibit. Posted By PA Breast Cancer Coalition on August 16th, 2016 at 10:07 am | 0 comments. I heard so many horror stories but my story was nothing like that. My regular yearly mammogram found my breast cancer in May 2010 and no one ever wants to hear those words, “you have breast cancer.” What is amazing now is that when I look back on it, it has taught me so much. After chemo treatment, I couldn’t eat for the first two days but I never got sick. I must really have an angel on my shoulder. My husband Jim attended every one of my treatments with me. Our son who lives in Montana flew home to be with me through my first chemo treatment. Our daughter lives nearby and she’s the one who always pushed me to get mammograms, and she’s the one who brought me meals. I first learned about the PBCC through my nurse navigator. Since then I was honored to be asked to represent Indiana County in the PBCC’s traveling photo exhibit, along with Maria Swinconis and Mary Waugaman. I was a guest at the 2015 conference and heard the announcement that 3D mammograms are now covered by insurance, and I called to tell my daughter that news right away. Indiana Hospital just got 3D mammograms and I said, “Honey, go get that mammogram!” I learned so much at that conference. There were things I forgot to ask my doctor and I was able to bring home so much medical information. We live in a beautiful home on 40 acres the woods. There is a property connected to ours with a house that had been empty for over seven years. Sometimes during treatment, I’d go back there and sit on the rickety steps where my husband couldn’t see me crying. I dreamed of owning that house and now I do! I put every bit of paint and wallpaper on it myself. My husband wanted to name it Dorothy’s Dream House but I’m calling it B & J Retreat after my daughter Bridget and son Jimmy. We rent it out by the night or by the week. My beautician is planning to hold meditation classes there. My favorite things to do are sewing and gardening. I just bought fabric to make drapes for my living room. I have vegetables and flowers in my garden and everyone laughs at this but I love getting on my tractor and mowing the grass. That’s my meditation time. Two weeks from now I’m having knee surgery. The surgeon wanted to have a physical therapist work with me until he heard that my husband and I cut down two big trees on Saturday. He said, “You do enough. You won’t need a therapist.” I don’t stop. Posted By PA Breast Cancer Coalition on April 14th, 2016 at 12:16 pm | 0 comments. 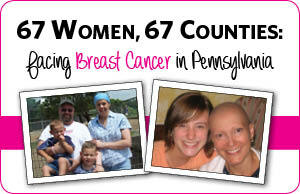 The PBCC’s traveling photo exhibit 67 Women, 67 Counties: Facing Breast Cancer in Pennsylvania is now featured online! This educational work of art celebrates the life, courage, hope and dignity of women and families who have battled breast cancer. See the faces of the exhibit: Click here to see the new online display! Just like the traveling exhibit, the website showcases at least one woman from each of the state’s 67 counties, including photographs, quotes and stories. The women featured on this website serve as a unique reminder of the emotional and physical toll breast cancer takes on them and their families. The exhibit encourages women to learn about and practice early detection through yearly mammograms, monthly breast self-exams, and annual clinical exams. If you would like to host the traveling photo exhibit in your area, click here to fill out a request form. Posted By PA Breast Cancer Coalition on April 4th, 2016 at 9:44 am | 0 comments. 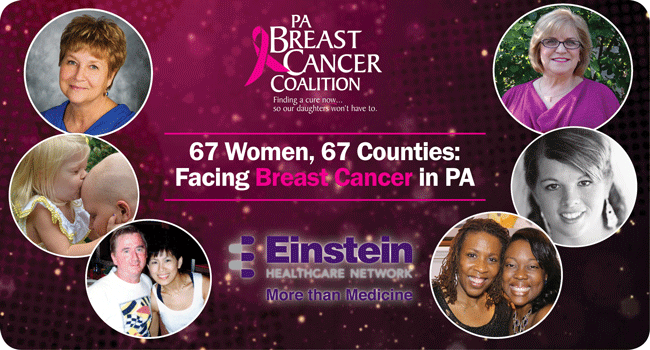 Join Montgomery County Survivors and the PA Breast Cancer Coalition on May 17, for our exhibit opening at Einstein Medical Center Montgomery. Become inspired through stories and learn the importance for women to get annual screenings. Admission to the reception is free of charge. Want to go? This exhibit includes a kickoff reception beginning at 5pm with a full program to follow, showcasing local breast cancer survivors sharing their stories as they faced the disease. The exhibit will be open through Monday, May 30. Don’t miss out on the opportunity to see it! For more information or to RSVP to the event, click here! Posted By PA Breast Cancer Coalition on March 15th, 2016 at 8:32 am | 0 comments. 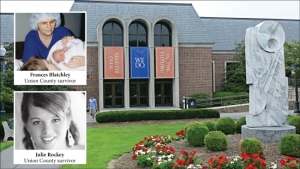 Join Union County survivors and the PA Breast Cancer Coalition March 23 for the first photo exhibit opening of 2016 at Bucknell University’s Elaine Langone Center beginning at 5:30pm. This will be the first time our exhibit goes on display in Union. Hear inspiring stories and learn the importance of annual screenings for women. Admission to the reception is free of charge. Want to go? The exhibit features local breast cancer survivors who will share their stories and experiences as they faced the disease. The reception beginning at 5:30pm includes light refreshments and music. The full program is scheduled to start at 6:00pm, featuring local breast cancer survivors sharing their stories and experiences as they faced this disease. This exhibit will be open through April 3, so don’t miss out on the opportunity to see it. For more information or to RSVP to the event, click here. Posted By PA Breast Cancer Coalition on August 17th, 2015 at 9:16 am | 0 comments. Messages of hope and courage will accompany the hustle and bustle of travelers at Harrisburg International Airport this fall. The PA Breast Cancer Coalition’s photo exhibit, 67 Women, 67 Counties: Facing Breast Cancer in Pennsylvania will be on display at HIA Sept. 24 – October 6. Don’t miss our kick-off opening reception Thursday, Sept. 24 beginning at 6:00pm with light refreshments following by a program including local breast cancer survivors. Want to attend? The photo exhibit shares real quotes and photos from women who have faced breast cancer in all of PA’s 67 counties while promoting the importance of early detection. To RSVP for the opening reception, email Stacy@PABreastCancer.org or call 800-377-8828, ext. 3040. We hope to see you there for this inspiring and empowering event! Posted By PA Breast Cancer Coalition on May 15th, 2015 at 8:35 am | 0 comments. It was a powerful and inspirational evening in Erie last week as local breast cancer survivors shared their stories of hope and courage. The PA Breast Cancer Coalition was honored to showcase its photo exhibit, 67 Women, 67 Counties: Facing Breast Cancer in Pennsylvania at the beautiful Ramond M. Blasco, M.D. Memorial Library. More than 100 guests participated in the exhibit opening reception on Thursday, May 7. From the moment they hear the words, “You have breast cancer,” every woman endures a unique and complicated battle. 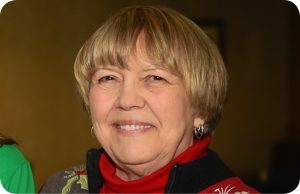 Survivor Sue Fassette is a 3-time survivor now thriving through her connections to the Erie support group Linked By Pink. Survivor Bettylou Perkins spoke of her own struggles and determination to beat breast cancer from Day 1. The PBCC was also thrilled to welcome Mary Rennie, Executive Director of the Erie County Public Library, Joanne Grossi, Regional Director for Region III of the U.S. Department of Health and Human Services, Erie County Executive Kathy Dahlkemper and Dr. Greg Engel, Medical Director of the Comprehensive Breast Program at UPMC Hamot as speakers for the evening. We want to thank everyone who shared in our celebration of life, courage, hope and dignity last week. If you have not seen the exhibit yet, you still have time!. It will be on display at the Blasco Library through May 17! Posted By PA Breast Cancer Coalition on May 15th, 2015 at 8:28 am | 0 comments. 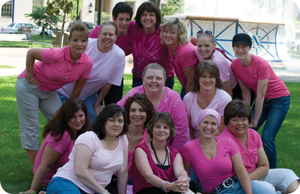 Linked By Pink is a nonprofit organization providing assistance to younger breast cancer patients. Traditionally, Linked By Pink serves women who were diagnosed under the age of 45; however, that age limit is temporarily extended to women under 55. If you fit the age requirement and live within a 45-mile radius of Erie, you are welcome to apply for financial help through one of their grant programs. The grants offered cover medical, travel, or living expenses. Gas cards are available for travel to medical appointments, and rent, mortgage, and utility payments are paid directly to the provider. Further details about eligibility and the application forms are at www.linkedbypink.org.